Bat infestation is such disgusting situation that no homeowner ever want to contend with. Though they eat other insects thus help in natural control of the insect infestation, their presence in a building have so many undesirable effects and this leaves getting rid of them as the only best solution. But doing bat removal on your own may not be as effective as letting experts like us do it. Dealing with bat can be quite a challenge since they can squeeze themselves in very tiny holes that you can never imagine. This is why you need to let an experienced team like ours who understands all the behavior of these ugly mammals and let us remove them from every corner of the premises. Spread of diseases – recent statistics indicate that bats are the second leading cause of rabies in human beings. Therefore being in close proximity with them for a considerable period of time greatly increases your chances of contracting rabies. Damage to the attic – Bats will in most cases infest the attic region. Their droppings and urine are known to do a lot of harm to the attic material and reduce its usefulness in insulation. This is why you need to get rid of bats as soon as possible. Irritating smell – bat droppings and the smell of their urine have a characteristic pungent smell that can make the whole building smell so bad. 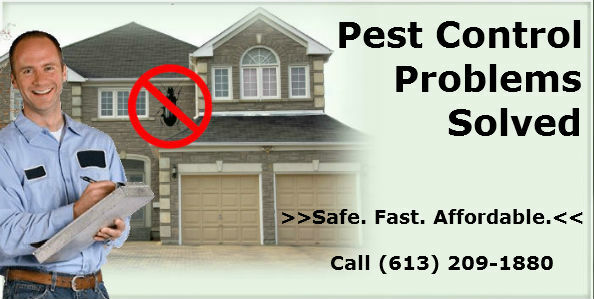 In order to avoid all the above problems when you have bats in your building, call Pest Control Ottawa today for professional bat removal and extermination services in Ottawa. Our service area includes Ottawa, ON and the surrounding areas. 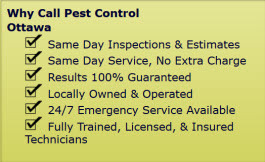 Bat Removal and Extermination Services in Ottawa, ON call (613) 209-1880. Call (613) 209-1880 to speak immediately with a technician.